Pikachu is much stronger than he was before. His smashes are all very good. His down smash is perfect for setting up for juggles, and his front smash has range, priority and power. His aerials are all very fast. 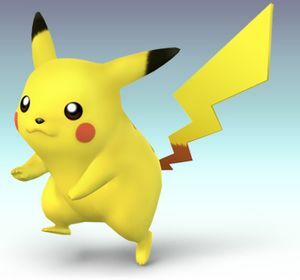 Pikachu can easily juggle opponents with thunders and fast aerials. Headbutt Headbutts his opponent, it can be tapped to spam the headbutt. + + + + Side Kick Sticks both feet forward damaging enemies in front. + + + + High Tail Swings his tail in an arc upwards. + + + + Tail Whip Swings his tail on the ground knocking and tripping enemies back. while dashing while dashing while dashing while dashing Tackle Pikachu leaps and strikes his opponent with his head. + + + + Power Discharge Pikachu discharges a small beam of electricity in front of him dealing heavy knockback to his opponents. + + + + Tail Flip Pikachu does a flip knocking his opponents upwards. + + + + Spark Tackle Pikachu spins on the ground while discharging electicity. after grab after grab after grab after grab Discharge Pikachu shocks the opponent. after grab after grab after grab after grab Electris Carry Puts opponents on its back and electrocutes them. This can be used as a chaingrab. after grab after grab after grab after grab Submission Tumbles backwards and throws its opponent out. after grab after grab after grab after grab Pika Headbutt Headbutts its opponents upwards. after grab after grab after grab after grab Slam Slams opponents on to the ground. This can chaingrab some characters, being a 0-death on Fox. Pika Ball Spins into a ball. + + + + Electric Spin Spins forward while emitting electricity. + + + + Pikacopter Spins around backwards. + + + + Aerial Tail Flip Flips its tail upwards. This move has very low knockback, which makes it a great juggler. + + + + Electric Twirl Twirls downwards while emitting electricity. Thunder Jolt He launches a spark that hops along the ground. + + + + Skull Bash Pikachu shoots forward. The longer you charge this attack, the farther he'll go. + + + + Quick Attack He dashes in any direction. Input another direction to make him dash again. + + + + Thunder He calls down a thunderbolt. It's quite powerful, but will not pass through platforms right above Pikachu's head. If the platform is a good distance above Pikachu, the thunderbolt will travel through platforms and terrain. if the bolt hits Pikachu, it will use a powerful proximity attack that deals more damage than the standard bolt. Don't make yourself predictable and spam this though, as an opponent can easily wait to punish the cooldown lag. This attack can also be reflected and absorbed (like with Lucas's or Ness's PSI Magnet). He starts crackling with electricity. + ( or )+ or or He waves to the camera, saying, "Pika, pikaaaa!" + He rolls around on the ground. Volt Tackle: Pikachu transforms into a huge sphere of electricity that you can move around the screen to hit anything in the path, plus Pikachu gains the power to go through platforms. Press to make Pikachu Spark, damaging anyone in the vicinity. This attack lasts about 15 seconds, and will do around a good 60-80% damage. However, this attack is hard to control, much like Sonic's Final Smash. This page was last edited on 7 December 2011, at 16:41.